And it's the beginning of a whole new era. It has finally arrived, the first AMG V8-powered Aston Martin, and that honor goes to the DB11. In place of the twin-turbo 5.2-liter V12 with 600 hp is a 4.0-liter twin-turbo V8 with 503 hp and 513 lb-ft of torque. Not exactly a lightweight. Although this engine was manufactured by AMG, Aston Martin engineers were heavily involved, designing, among other things, new engine mounts, air intake, and exhaust and wet-sump lubrication systems. Aston Martin claims a 0-62 mph time of four seconds flat and a top speed of 187 mph. But the main reason why this engine was developed was to improve fuel economy while maintaining blistering performance. Tipping the scales at 3,880 pounds, the DB11 V8 is 253 pounds lighter than its V12 sibling, resulting in a car that’s not only more fuel efficient – an EU combined fuel economy rating of 28.5 mpg – but also more agile and a more comfortable grand tourer. Aston Martin claims there's a "more sporting bias," which makes sense because more of the mass is centered within the wheelbase. Visually, the DB11 V8 differs with its double-vented hood, whereas the V12 has a quad-vented one. There are also unique alloy wheels and dark headlamp bezels. The interiors are also identical, meaning customers benefit from the same standard equipment levels and choice of colors and trim options. In other words, the DB11 V8 isn’t a downgrade compared to the V12, but the driving behavior has somewhat changed. 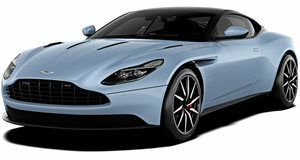 The V8-powered DB11 is on sale now priced from $198,995.